Music and revolution have immaculate relation between each other. Both have proved to be inevitable in the contemporary world. Popular music has always been part of revolutions and upheavals. Music with its extra ordinary power to communicate and persuade has influenced many revolutions and social changes from the very early protests like the one done by the Red Indians who reacted to the Pilgrim fathers, the ‘white masters’, and it still goes right here in the latest Jasmine revolution and the Arab spring. Even the revolutionary leaders of French Revolution took music seriously. They realized its potential for changing the way people think and feel. In 1795 they established a school to train bands for the National Guard, the army. Composers were encouraged to write revolutionary songs. Between 1789 and 1800 more than 1300 such rhymes were written. Thus the Music and social protest grew together and got interwoven in our history like two parallel vines. The street troubadours of fourteenth century Europe and the rap singers of today’s black ghettos fulfill the same purpose: they are not singing only to make a living, but they are singing to denounce poverty and injustice. So did the African slaves in South America, and they transmit their message, from the sixteenth century plantations on to the present social media age. African tribal chants have been exported and transformed into a variety of shapes; in North America, they became blues and gospel music, when in South America, and particularly in Brazil, they evolved into the samba and its many incarnations. Through the lyrics and rhythms, revolutionary movements provided its adherents and potential sympathizers with messages whose implications went beyond the scope of what the lyrics said and the rhythms implied. Because of its nature, music always offers all-pervading glimpses into the thinking and planning of a revolution, subjects often so nuanced that they elude other written texts. At times of active political confrontation, revolutionary songs used slogans and rally phrases to make simple and direct statements, while in other moments of clandestine activity they used heavily coded and nuanced forms of spreading political messages. And, finally, revolutionary songs became a vehicle to narrate the details and lessons that are reflected in the the moral codes and values systems of an emergent popular culture. Rapping, Rock band, Hip-Hop and many more genres of music are very successful in mobilizing people for various causes. There are many names while we debate Music, revolution, reformation, renaissance and such empirical discourses regarding culture and society. In the history of music, there have been many great artists who have created tunes and made recordings that have been cherished by millions of people. And then, there are those who transcended mere greatness to become something even bigger. These are the game-changers, the ground-breakers, the explorers, the visionaries. These are the artists who took a look at the state of music and wondered, “Why can’t it be this way?” These are the people and the groups who revolutionized music. Artists like Bob Marley, Beatles Little Richard, Frank Zappa, John Lennon, Louis Amstrong and many more have done crucial roles to protect their identity and culture through their gifted musical talents. Bob Marley is considered the emperor of music in the third world. Perhaps no genre is as inextricably tied to one, single artist as reggae is to Bob Marley. 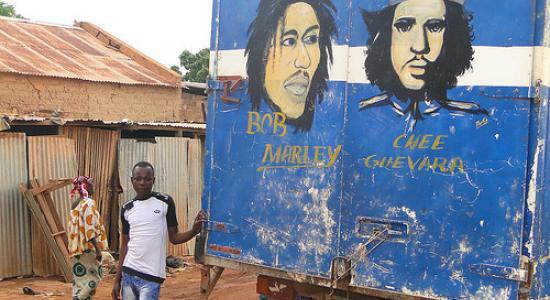 For billions of people, Marley isn’t just the face of reggae, he is reggae. With a knack for killer melodies, and lyrics about love, loss and standing up for your rights, Marley took Jamaican music to a global audience. By the mid-’70s, he was inspiring both the old guard (Eric Clapton and the Stones) and the young punks (The Clash, The Police), who helped bring Marley’s joyful noise to new ears. Thirty years after his death, he’s still reggae’s greatest legend. (Bryan Wawzenek). Today, as it was earlier music is a form of struggle and resistance for many marginalized sections of the world including the blacks and Muslims. Various genres in Hip-Hop have been very successful in creating awareness among the society against the injustice and human rights violation. The Palestinian Hip-Hop featuring artists like Shadia Mansour, Lowkey and Narcissist are big hit and they are very active in highlighting the Arab identity and the self determination of Palestine. They lament the occupation of their land by the Israel and other western forces with word firing and rapping. Their existence is their resistance. Kurds, with a variety of music struggle in the midst of large inequality and injustice among the Turks. So do the Turks in Germany. Newly emerged Muslim Hip-Hop groups resist the trending Islamophobia though powerful counter messages. In India, the land of cultural diversity, many marginalized sections are fighting the hegemony of Savarna with their own indigenous music and other art forms. In Tunisia, Egypt and Libya, where the recent Arab spring happened; the Hip-Hop has a considerable role in mobilizing people. Mercan Dede, a Turkish nay expert has come out with his recent project revolution revelation with a some noble causes. Bell Hooks has commented on the adverse effect of music in the society as she criticize the gender inequality, injustice and white superiority in certain music like Gangsta Rap even though they are black music. She also says that ‘young black males are forced to take the heat for encouraging via their music the hatred of and violence against women. The writer reveals that black male sexism is real and it is in America’s music. In India music was an impetus to accelerate the freedom struggle against the British. Revolutionary songs written by Rabindra Nath Tagore, Allama Iqbal and Makhdoom Muhyidheen were used in the music. And they were hugely successful in mobilizing people. Jane wale sipahi se poocho (Ask the departing soldier, where he is going) is a best example for the stereotypical revolutionary songs.